This is the DP-Tuner "F6" 16-Position USER PROGRAMMABLE Smart-Chip! The F6 chip has all of the same great features as the F5 with the added bonus of being end user updatable. If you should need to get your programs updated or just want to add some new programs, we can just email them to you and you can burn them to the chip yourself with the included cable and software...no need to send the chip back to us for updating, you don't even have to remove it from the truck to reflash it! 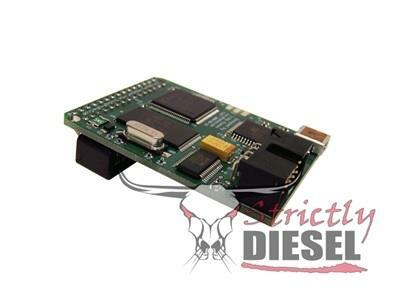 • THE MOST ADVANCED 7.3L POWERSTROKE CHIP AVAILABLE...PERIOD! See the additional images provided for samples of the EX (Keyfob style) and Gauge style switches. Please Select the DP-Tuner Switch Style you would like. The EX switch is the small "Keyfob" style switch and the GX is the 2-1/16" Gauge Pod switch. Please Select the DP-Tuner Switch Display Color you would like. This is the color the position indicator will be displayed in. If you selected the GX Gauge Style Switch, select your switch DIAL color. If you selected an EX switch, leave this option as N/A. If you selected the GX Gauge Style Switch, select your switch BEZEL color. If you selected an EX switch, leave this option as N/A. THESE PROGRAMS ARE FOR TRUCKS RUNNING THE BASIC MODIFICATIONS (INTAKE, EXHAUST, GAUGES, DROP-IN TURBO, ETC). IF YOUR TRUCK HAS LARGER THAN STOCK INJECTORS, TWIN HIGH PRESSURE OIL PUMP, CUSTOM TURBOCHARGER WORK, CUSTOM TRANSMISSION WORK, NITROUS OXIDE, PROPANE INJECTION OR OTHER HIGHLY CUSTOM WORK...PLEASE ORDER CUSTOM PROGRAMS FROM THE NEXT OPTION SECTION. Select the DP-Tuner performance programs you would like loaded on your chip. Programs are generally loaded in order from Lowest Horsepower Increase to Highest Horsepower Increase. Since many customer also add "high idle" or "decel/exhaust brake" type programs, we will order them on the chip in a way that makes them the easiest to use. If you would like a specific order, please let us know in the customer notes section at the bottom of this page. THESE PROGRAMS ARE CUSTOM WRITTEN FOR TRUCKS WITH SIGNIFICANT MODIFICATIONS. DUE TO THE NATURE OF THE MODIFICATIONS AND THE SIGNIFICANT DIFFERENCES BETWEEN MANY OF THE HIGH PERFORMANCE AFTERMARKET PRODUCTS, THESE PROGRAMS DON'T USE A HORSEPOWER RATING AND ARE INSTEAD SELECTED BY FUNCTION. If you are interested in some of the "non performance" programs (high idle, lope idle, etc), please select those from the option above as they are still billed at the lower price. These are the most commonly used accessories with a DP-Tuner chip. Just check the box by any accessory that you need and it will be added to your order with the chip. Please enter any additional information pertaining to this chip order in the field below. This would include a specific desired program order or notes about how you would like any of the custom programs done (specifically the "Custom Drag Race", "Custom Sled Pull" or "Custom Other" programs).